Covered Call Options offer potential investors a low risk way of option trading in such a way that, if done correctly, can easily provide a regular income stream for the rest of your life. But did you know that if the funds that you have in your brokerage account are also connected with a margin loan, you can effectively double the profits from covered call options that you would otherwise receive if you didn't use this facility. A margin loan is one of the few loans that you can easily access without any credit checks or formalities that usually go with getting a loan. The reason is, because it's a loan that can only be used to purchase shares - and the shares you purchase in turn become collateral, or security, against the loan you will receive to buy more shares. Let's say you start with $20,000 in your brokerage account and wish to buy shares with it. 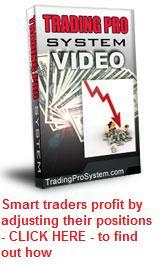 Your $20k will allow you to buy 800 shares currently trading at $25 per share. These 800 shares in turn become security for a lender, who is prepared to lend you another $20,000 to buy another 800 shares at the same price. So now you own 1,600 shares, 50 percent of which are from borrowed funds, the other 50 percent from your own money. You pay interest on the borrowed portion at the going interest rate. This is why getting a margin loan is so easy to get and requires no credit checks, income statements or other 'hoops' you are normally required to jump through to get a regular loan. There is enough security in the assets (shares) themselves to cover any default on the loan - and if any problem arises, the broker can quickly liquidate your assets (sell all your shares) and close out the loan. Much easier than trying to repossess your car or sell your home. Most margin lenders will have a ratio that they are prepared to lend you on any given stock. The 'blue chip' stocks usually carry a margin of around 65 percent or more, which effectively means that if you use the maximum margin available, you can increase your shareholding by 130 percent. But if you do that and the stock price suddenly falls, you will get a "margin call" from your broker, requiring you to top up your account with more funds to cover the increased risk, otherwise they will liquidate your stock. This is why it is always best to use less than the maximum margin available. It gives you a buffer should the price fall. I would recommend that where 65 percent is offered, you only use up 50 percent margin, which allows you to increase your shareholding by 100 percent - in other words, double it. Writing covered calls involves selling call options over shares that you already own, or have just purchased. For more information about covered call options, go to the main contents page and scroll down to persuse the various topics on the subject. The call options you sell are 'covered' by the stock you have purchased. We say 'covered' because selling options (as opposed to buying them) exposes you to potentially unlimited risk, should the underlying stock price move strongly against your anticipated direction. 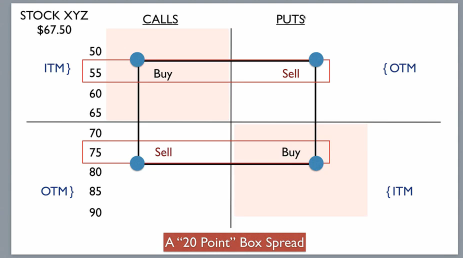 Selling call options means that you promise to allow others to 'call' on your to sell shares to them at an agreed price. So can you imagine what it would be like to have to go to the stock market and purchase shares in order to sell them at $20 when the current market price to buy them has risen to $40? The higher the share price goes, the more you are "exposed" to financial loss. This is why it is called selling "naked" call options. But if you already own shares, then your potential loss is limited to the difference between the call options strike price and the price you paid for the shares. Hence the name, "covered call options". Now, getting back to the matter in hand. 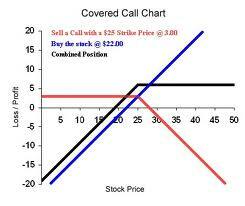 Selling covered call options allows you to receive an income from the shares in addition to dividends. If you are trading on the US exchanges, then each option contract covers 100 shares, so in our example above, you could sell (sometimes called 'going short' or 'writing') 8 call option contracts on 800 shares. But if you could add to your $20,000 capital a further $20k using a margin loan, so that you now own 1,600 shares, then you are in a position to write 16 covered call options contracts and double your income. If you combine this with another put option strategy we have discussed elsewhere, allowing you to purchase your shares at a discount, you can earn even more option income and lower your overall risk at the same time.